This Angular 7 online certification training has been designed to help you create web applications, deploy Angular CLI, Angular components, TypeScript, Bootstrap and more. You will learn Angular Dependency Injection, Directives, Pipes, Forms, Routing, HTTP Promises and more through hands-on projects. What will you learn in this Angular 7 training course? Who should take up this Angular 7 training course? Why should you take up this Angular training course? Angular is a structured framework for dynamic web applications that are much simpler to create, thanks to lesser coding and using of the HTML framework as the basic template and extending its syntax and reach. The ease with which it can work with the MVC components makes Angular such a popular technology. This Angular certification training gives you a hands-on experience in working with Angular 7 by applying it in real-life projects. This way after completing the training, you will be well-equipped with the skill set to work in the real world for top salaries. What Angular 7 project you will be working on? Topics: In this Angular 7 project, you will design a product menu for a certain e-commerce venture. You will extend the capabilities of HTML using Angular 7. This project will show you how to accomplish this using minimal amount of coding and deploy excellent features of Angular 7 for creating responsive web designs. What is Angular 7, what are its features and advantages, understanding the Angular Technology Stack and Angular Library Components. What is TypeScript, what is its need, how to install TypeScript, Nodemon for monitoring changes, interfaces in Class, String Templates, Maps, Sets and Object Destructuring, Var, Let, and Const keywords. The top features of Angular, CLI prompts, Angular Compiler, dependency and document updates, Angular elements and improved accessibility. Building with Angular Components, building web components, custom elements, Angular CLI, ng-packagr, the lifecycle of Angular Components, creating a component and Deeper Nesting. What is a responsive web design, building responsive web design with Angular, introduction to Bootstrap, creating responsive layouts with Bootstrap and code design for responsive websites. What is event binding, how to create event binding in Angular, building directives, template model, what is SystemJS and Webpack, responding to DOM events mostly created by users and getting inputs by binding to these inputs. Understanding Dependency Injection, the Dependency Injection API, Angular framework for Dependency Injection, coding pattern for dependencies, overview of service and how to create a service. 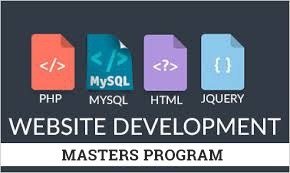 The function of a Directive in Angular, extending the power of HTML, giving it a new syntax, various types of Directives, how to create a custom Directive, different types of built-in Directives and custom structural Directives. What are Pipes in Angular and their features, transforming value in Angular template, various built-in Pipes in Angular, how to use it in any template and creating a custom Pipe in Angular. 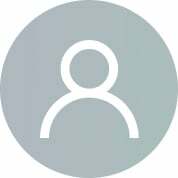 What are Forms in Angular and what are their functions, advantages of Forms, template-driven Forms, reactive Forms, what is Angular Validation and Model driven approach. What is Angular Routing, its fundamentals, benefits and features, building a single page application and updating it dynamically with Angular Routing, what is Parameter Routing, Router Lifecycle Hooks and Child Routes. What are Promises and Observables in Angular, comparing the two, handling HTTP requests with Promise, resolving multiple values with Observables, RxJS library for reactive programming with Observables, interacting with http get() in Angular and http Post. Introduction to testing Angular 7 applications, setup and tools for testing, deploying Angular Test Bed for testing on Angular framework, testing services in Angular, E2E and DOM testing. 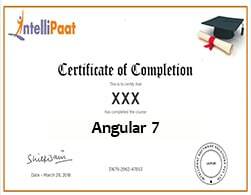 This course is designed for clearing the Intellipaat Angular 7 Certification. 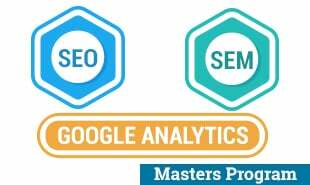 The entire course content is designed by industry professionals in order to help you get the best jobs in top MNCs. As part of this training, you will be working on real-time projects and assignments that have immense implications in the real-world industry scenarios, thus helping you fast track your career effortlessly. The Intellipaat certification will be awarded upon the completion of the project work (after expert review) and upon scoring at least 60% marks in the quiz. Intellipaat certification is well recognized in top 80+ MNCs like Ericsson, Cisco, Cognizant, Sony, Mu Sigma, Saint-Gobain, Standard Chartered, TCS, Genpact, Hexaware, etc. I am feeling very satisfied with this course and thanks to each member involved in it. Videos are nice. The trainer is very good. Contents are up to date. What should I say? A good training provider. Thanks a lot! This course is very nice and interesting as I go through it. Before taking it, I was nervous because I didn’t have enough knowledge, but now I can say that I know more than a beginner.... Wonderful job! Thanks intellipaat for building my career. Why should I learn Angular 7 from Intellipaat? You will be working on real-time Angular 7 projects and step-by-step assignments that have high relevance in the corporate world, and the curriculum is designed by industry experts. Upon the completion of the training course, you can apply for some of the best jobs in top MNCs around the world at top salaries. Intellipaat offers lifetime access to videos, course materials, 24/7 support and course material upgrading to the latest version at no extra fee. Hence, it is clearly a one-time investment. 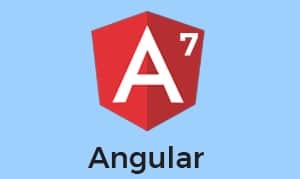 Sign Up or Login to view the Free Angular 7 Training course.